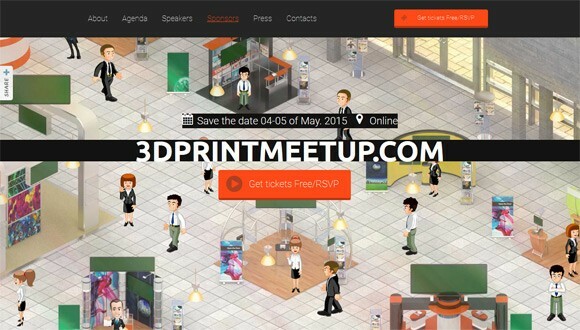 3DPrintMeetUp is a virtual expo that will be held entirely online on 04-05 May, 2015. It is open and free for anyone interested in 3D printing and you “can be there” regardless of your actual location. The 3DPrintMeetUp uses the ExpoLike platform for virtual expositions that was already used for a virtual Crypto Currency expo last year as well as some other targeted online events. The event will feature a series of lectures from leading 3D printing professionals, an expo hall where attendees can find information about available products, view demonstrations, ask questions, and receive answers from company representatives, and various opportunities to network with members of the 3D printing community. There is already a short preliminary agenda available, though more things should be added to it as the event date approaches. We are going to be taking a look at the online event in May as it should interesting to check out, so you might want to give it a try as well.